The Department of Geology offers undergraduate programs of B.Sc. in Geology and B.Sc. in Environmental Geoscience, both of which are elligible for APEGS (Association of Professional Engineers and Geoscientists of Saskatchewan) membership that is transferable to every other jurisdiction in Canada. We also have graduate programs including M.Sc. and Ph.D., with research areas covering both "hard rock" and "soft rock" studies, mineral and oil-gas resources, and environmental studies. We have an established reputation for training highly "rock-conscious" students, and we are extremely pround of our students employment record. 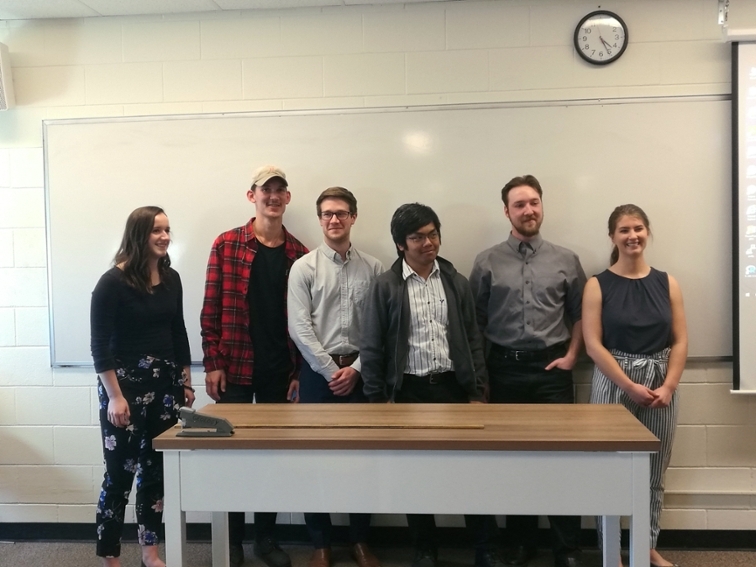 April 12, 2019: Five undergraduate students defended their theses successfully. Topics varied from structural analyses in Precambrian terranes of Saskatchewan and Phanerozoic rocks in southern Madagascar, basement geology of the eastern Athabasca Basin, to oil migration and production patterns of the Middle Member of the Bakken Formation in southeastern Saskatchewan. New mapping techniques and results were presented as well as new approaches to estimate oil potential. The students showed excellent competence defending their theses to a committee and an audiance of fellow students and guests. This was an excellent demonstration of the high quality undergraduate research at the Department of Geology. Congratulations to our undergraduates!